Current indexing data stores information for valid restore points that are currently available in the backup chain on the backup repository. For example, if the retention policy for a backup job is set to 14, Veeam Backup Catalog will contain indexing data for 14 restore points and 14 backup job sessions. Historical indexing data stores information for obsolete restore points: the points that were removed from the backup chain. When you run a backup job to create a new restore point, the earliest restore point is marked as obsolete and removed from the backup chain. Indexing data for this restore point in the Veeam Backup Catalog is not removed. Instead, it is marked as historical. Historical indexing data help the user to accomplish file search in backup files that were archived to tape or to a secondary backup repository. By default, Veeam Backup Enterprise Manager keeps historical indexing data for 3 months. 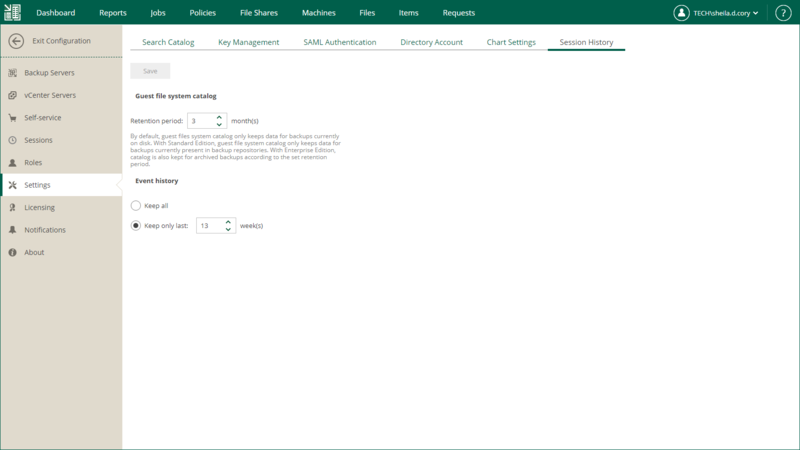 To change this value, navigate to the Configuration > Settings > Guest file catalog section in Veeam Backup Enterprise Manager.